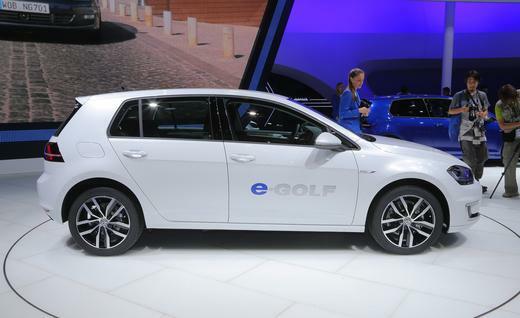 Last year at the LA Auto Show, the Volkswagen e-Golf was introduced with a water-cooled battery. Later at the Detroit Auto Show, Volkswagen had quietly removed all terminology related to water-cooled batteries, and then most recently, at a Volkswagen drive event in Germany, a keen reporter from Green Car Reports noticed the battery on display had no liquid-cooling components. Now, it’s official. According to Volkswagen’s Darryll Harrison, the brand’s US manager of brand public relations west, said that battery performance was not impacted at all by temperatures when using the right battery chemistry. As a result, Volkswagen deemed it unnecessary to have liquid cooled batteries that add complexity, and extra weight that decreases range (albeit a small amount I’m sure). Volkswagen’s new e-Golf does use a thermal control to regulate the amount of energy coming out of each individual cell to keep heat down, and any heat energy that is generated is dissipated into the electric vehicle’s chassis away from the battery pack. Generally speaking, regarding the system, it’s important to note that the e-Golf was designed with efficiency in mind. The battery pack utilizes ultra-efficient lithium-ion cells that deliver 25Ah per cell with an energy density of 59Wh per lb. The pack is comprised of 264 cells, packaged into 27 modules (of either 6 or 12 cells) delivering 323 volts and weighing in at 700 lbs. As it relates to battery temperature, VW has developed a Battery Management Unit with an intelligent thermal control that allows the pack to remain within an optimal temperature window, helping to maintain performance and range in a variety of temperatures. This system allows the e-Golf to operate, even in more extreme temperatures, without the need of a cooling system and without dramatic impacts in performance based on testing. In terms of the battery pack, the engineering goal was to develop a highly efficient system as opposed to one that focused on charge-time or capacity (like some of our competitors). In partnership with Panasonic, VW utilizes a lithium-ion cells designed for gentle charge and de-charge during use which helps to reduce heat and energy consumption often associated with cells designed for rapid charging and de-charging. Our engineers refer to them as “marathon cells.” Additionally, without a cooling system weight savings are achieved which aides in overall efficiency of the vehicle. Due to the efficiencies achieved, minimal waste heat is created during operation (i.e. during fast charging) and is quickly directed by the battery metal structure into the chassis, away from the battery, helping to prevent extreme temperature conditions inside the pack. If you need to fast charge between trips more often then slow charge over night (up to 20 hrs for a full charge :-o), your’e jeopardizing battery life and risking to void warranty? What? It’s not terrible, it was a design parameter defined as a goal by Volkswagen engineers. This car is designed for economy, not long distance travel, except when done sparingly. Install a level 2 charger at 240V and 30 amps, and the charge time is down to 3 to 4 hours from near empty for level 2 charging, which is completely acceptable..
Re: What car did you give up to get your eGolf?